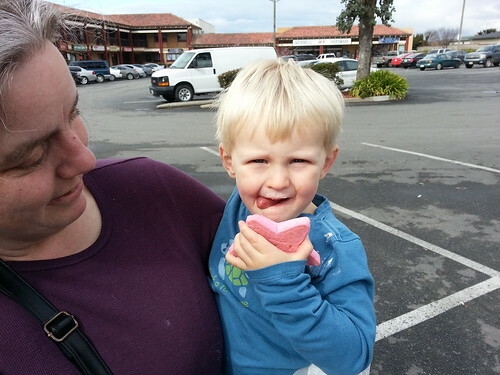 Owen’s pink star cookie – Naming a blog is harder than naming a kid. Owen’s pink star cookie, a photo by caseyzero on Flickr. He licked all the sugar off the surface, discarded the rest. Mostly, he likes very very simple carbs, e.g. sugar. Normally, he likes cookies, but this is from a Mexican bakery, and those are less sweet, they tend to save the sugar for fillings/toppings. Otherwise, he likes veggies and meat, not starches like bread or not-very-sweet cookies. Tonight, he picked all the veggies out of his veggie fried rice, and at those, leaving the rice.